THE BRILLUSTRATOR: Red Hot Shootin' Irons! 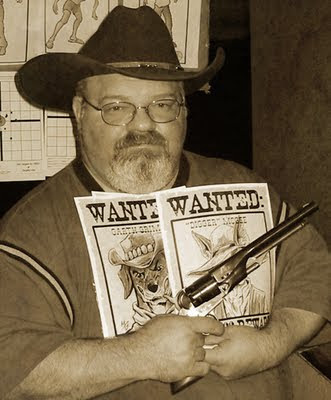 So, last night I had the opportunity to meet my friend (and fellow CLAW member) Michael Shaudis and his dad at the Bullseye Shooting Range to see and even fire some authentic, Old West-style handguns! Michael brought several really impressive pieces to our get-together including a Colt Navy pistol (which I'm posing with) and this wild looking thing called a LeMat, which has an extra barrel for a shotgun shell for when you run out of regular bullets! We didn't fire these two, but they were just BEAUTIFUL to look at! What I DID get to fire was a 22 caliber, frontier style Colt pistol and a 38 caliber Police Special. (If I a, getting any of this info wrong Michael will probably comment and correct me. He is basically an expert on these guns!) I also got to fire an authentic antique British Army Webley, cira 1895! It was an exceptionally cool piece of ordinance! All in all, it was a lot of fun and very educational. 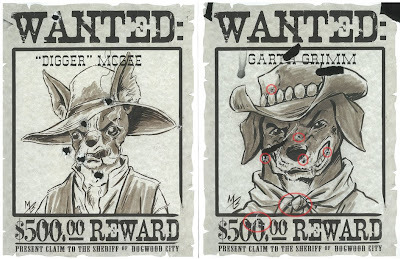 Now, the way this connects to my sketch blog is that I did a few quick drawings and used them to make mock-up "Wanted" posters to shoot at! And here are the posters that I did, plus a couple of them scanned with the actual bullet holes I put into them! I circled the 22 bullet holes which are more difficult to see than the 38s. I also shot other targets--I shot more than a few holes in these two, but these are the ones that relate here! 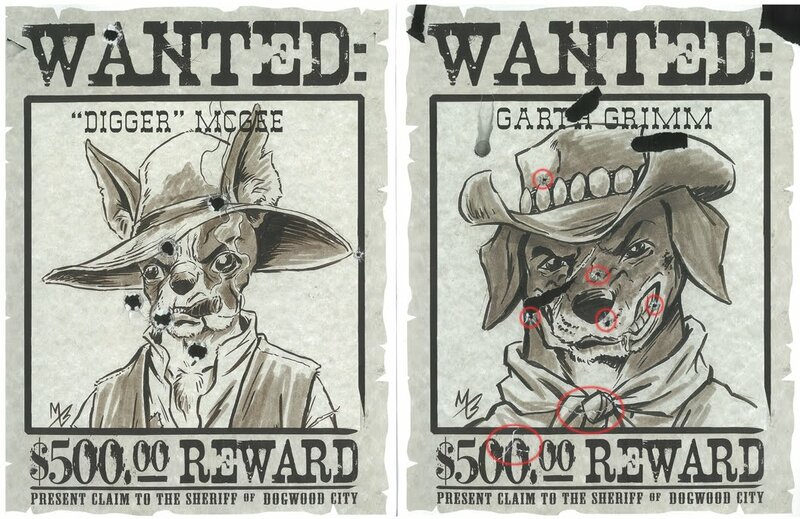 The characters in these sketches will hopefully end up being used in my "Dogwood Tales" comics. If it bothers you that I was shooting at cute dogs...trust me, they're BAD dogs! ¿when do you think the comic will be ready?, ¿will the characters wear chaps?